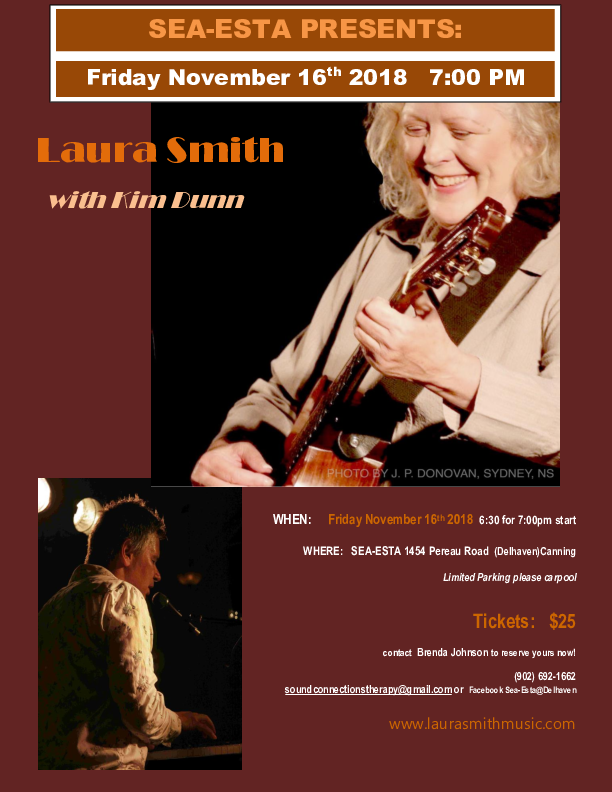 A singer-songwriter with four, full-length recordings, Laura has lived and worked in Nova Scotia since August of 1984. She has embarked on several tours across Canada over the years , performing in Europe, the UK and the United States. Her 1989 debut album, Laura Smith, was recorded after her demo was chosen from those submitted to the Variety Recordings competition at CBC in 1988. It opened the doors for Laura into the world of concertizing. After being selected for a Canada Council maintenance grant to continue composing in 1990, she began work on her second album, B’tween The Earth and My Soul. It was released in 1995 and garnered two East Coast Music Awards for Album of the Year and Female Artist of the Year. She was also nominated for a Juno Award. In 1997, her third album, It’s A Personal Thing, received seven nominations for East Coast Music Awards. A series of debilitating injuries curtailed her ability to compose, perform or record until I she was able to release her first recording in 16 years, Everything Is Moving, on Canada’s premier folk music label, Borealis Records. Laura co-produced this record with the uber-talented Paul Mills at his studio, The Millstream. She was delighted to include Kim Dunn's gorgeous song, Inspiration from his album of the same name. Kim and Laura work together in a truly touching and meaningful musical way. Returning to Sea-Esta for another sold out show I’m sure!